I went to Ireland for the first time in 2005. We traveled from Dublin to Shannon, staying in bed and breakfasts and mostly towards the coastal parts. We did not see nearly enough and we ate so much food. The one thing that appeared at almost every pub for dinner was Sticky Toffee Pudding. Just the sound made me order it the first time. I loved it and ordered it again every chance I got. Even with all the walking I think I gained weight on that vacation. Of course, much like all my other food curiosities I asked one of the hosts at our current B&B about recipes. She brought me out her favorite cookbooks and I began to browse. At the time, just having the measurements in weights and grams worried me so I didn’t buy a cookbook on my visit. Now, I just have the tools to weigh and measure in the metric system and recipes don’t scare me anymore. The funny thing about this dessert is that it contains dates. I’ll admit, I had NEVER tasted a date before. When I saw them at the store they reminded me of prunes and I wouldn’t eat them. When I first saw the recipe my heart sank. I wasn’t sure I wanted to make my own. But I loved the dessert and found a recipe I could make after I came home. I’ve tried lots of different recipes but I really like this one. People also call it Sticky Date Pudding with Butterscotch Sauce. There are versions with figs that I haven’t tried yet. But since discovering that I like dates I have discovered that I like figs also. Dates are high in fiber which helps prevent dietary LDL cholesterol absorption. They’re high in anti-oxidants and vitamins. Here’s a great article on all the benefits of dates. What better way to get all that good stuff in your diet, and maybe the kids, by disguising it as a dessert. If they’re going to eat sugar you might as well sneak something in it that’s good for them. Preheat oven to 180˚C (160˚C fan-forced) 350F. Lightly grease eight (½ cup capacity) metal dariole moulds or ceramic ramekins. If you don’t have moulds or ramekins you can do this in an 8×8″ baking dish. Just adjust your time accordingly. You won’t need a water bath for a baking dish. Place dates and water in a saucepan and bring to the boil over a high heat. Remove from the heat. Add bicarbonate of soda, stir until dates start to break down, set aside to cool, stirring occasionally. In a small bowl of the food processor blend the mixture until smooth. Most recipes just tell you to chop the dates and leave them in the small pieces, but I like the texture of the finished pudding if I blend my dates smooth. Beat butter and sugar in the bowl of your electric mixer or a hand mixer, gradually add eggs one at a time, beat until light and fluffy. Add date mixture, stir to combine. Sift flour, baking powder and salt in a separate bowl. Carefully fold through sifted flour, divide mixture evenly between the eight moulds, until 2/3 full. Place moulds in a baking tray, carefully pour hot water in tray until it comes up 1/3 of the side of the moulds. This is the water bath or bain-marie method. 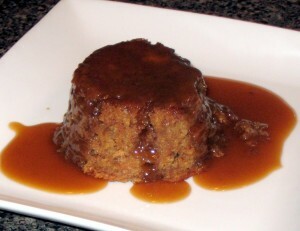 To serve, invert the hot pudding onto a serving plate, top with butterscotch sauce.